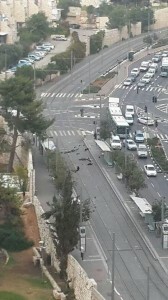 New attacks in Jerusalem. Nuclear Iran. Middle East ablaze. Volatility the new constant. Europe transitioning into a Muslim continent. America’s future: unknown. China rising. The end of Capitalism? A clash of civilizations (Islam and the West) brewing. A growing dissonance between accelerating technology and communications on one end, and decelerating personal relationships and intimacy on the other. This is the climate of our times; these are the events that are beginning to define our emerging young (21st) century. Are they precursors of things to come? Will they shape the future? You can almost feel a new world order in the making. Can we draw parallels between 2014 and 1914? How will the world change as new media replaces old media? As technology infiltrate every aspect of our lives? Will AI (Artificial Intelligence) supplant our minds? How will it impact on our dreams and imaginations? Will a machine replace a mother? And what will do with all the extra time? We can all use some respite from these upheavals. But not just respite. How about climbing the mountain to see the birds’ eye view of the horizon? How refreshing would it be to able t transcend the events on the ground and gain a 30,000 (or higher) foot perspective of life? An additional benefit of seeing the big picture is that it turns you into a shaper instead of a victim of circumstances. A leader instead of a follower. Proactive instead of reactive. Instead of the new world order shaping us, we can shape it. This is one of the great benefits in “living with the times” — reading the weekly Torah portion which we read during this time. If you want to be informed about events on the ground level (albeit, perhaps a distorted one, see last weeks article) open up a New York Times or another media outlet. And…agonize. But if you want to discover the deeper meaning of these events, and come away with a forward thinking plan, read the parsha. And… rejoice. Watch a beautiful sunset. Listen to a stirring symphony. Smell a delicate fragrance. Taste a delectable wine. Touch the soft cheek of a child. Those are our five senses at work – taking in and experiencing the aesthetics of our universe. But what else enters through our sensory doors? How stimulated – overstimulated – are we by the multitude of sights, sounds, smells, tastes and touches inundating our daily interactions? And what impact does it have on us? Are we products, perhaps even victims, of the forces seducing our senses? Take television: Does anyone know the far-reaching effects that visual stimulation has on our psyches? How much is it desensitizing us to “see,” “hear” and experience the more sublime aspects of our lives – the invisible and ethereal? So when we observe the world around us, the people, events and experiences of our lives, what should we be looking for? When we are seeking a loving relationship – or standing before a person we love – how do we assure that we are looking at the important things that matter, and not at superficial externals? And how do we attain such perspective when we are swamped with the endless flow of information assaulting our senses, numbing and distorting our priorities? This week’s Torah portion contains a fascinating answer to these questions. The chapter opens with the words “And G-d appeared to Abraham.” What did Abraham see? What does it mean to “see” the Divine? When we look at any particular object what do we see? First we see the physical features of the object – its shape, color, size and position. We may also notice its functions and the benefits they serve. With more focus, we can discern subtle elements and other aspects that may not have been ostensibly noticeable. Upon further study we develop a “deeper look” at the object and learn its unique composition of elements and molecules, and its biological and chemical makeup. Further down and in we discover its atomic structure, which in turn is comprised of sub-atomic particles. How far down the “rabbit hole” can we go? Left to our own mortal resources we can only go that far. But with help from an unexpected place we can actually come to perceive – to see – the essence of the object, and even beyond that. To see the Divine is to see the Essence of all reality, and to recognize that this Essence is beyond all reality. “He is the space of the universe, but the universe is not His space.” In some ways it means to see the forest from the trees; the roots from the symptoms; the causes from the effects. Abraham did two critical things to reach a point that he was able to see the Divine, to the point that “G-d appeared to him.” Firstly, he left his comfort zones (see The Greatest Journey Ever Taken) and embarked on a lifelong journey away from his subjective inclinations toward transcendence. Secondly, Abraham dedicated his life – and passed on his legacy to his children and generations to come – to focus not on the means, but on the end: To look beyond the seductive distractions of surface life and see what lies within; to search for the essence of things, rather than react to their symptoms. To seek out the purpose of existence and turn that purpose into the driving force of our decisions, rather than allow our existential needs and concerns to determine the course of our lives. Notwithstanding the conventions of the time, not conforming to the pressures around him, not enticed by the sights and sound of the universe, Abraham looked beyond and within them for a higher presence. This higher awareness then translates into action – to living a life of virtue, righteousness and justice. Once Abraham demonstrated his commitment, once he “paid the price” and did his part piercing through the outer layers and peering deep inside for the deeper reality, then the Higher and Inner Reality reciprocates, “and G-d appeared to him,” revealing the essential forces that shape all of existence, far beyond those that Abraham could ever discover on his own accord. “Know this fundamental principle: All the journeys and events that happened with the Patriarchs [Abraham, Isaac and Jacob] come to teach us about the future…they were shown what would happen to their descendants. For this reason the Torah documents in detail the experiences that transpired with the Patriarchs. No one should think that these are superfluous details; they actually pave the way and map out all the future events that would transpire with their children throughout history. There is nothing that happened to Abraham that would later not occur with his children (Ramban, Lech Lecho 12:6). How do we apply this principle to the opening of this week’s Torah portion: “And G-d appeared to him,” to Abraham? Indeed, a well known story suggests that Abraham’s Divine revelation was unique to him alone. When the Rebbe Rashab was a young boy, he went to his grandfather, the Tzemach Tzedek, to receive a blessing in connection with his birthday (Cheshvan 20). When he entered his grandfather’s room, he began to cry. His grandfather asked him why he was crying and he explained that in cheder (school), he had learned that G-d had revealed Himself to Abraham and he was upset, why G-d did not reveal Himself to him. The Tzemach Tzedek replied: “When a righteous Jew at the age of 99 decides to circumcise himself, he is worthy that G-d reveal Himself to him.” The Rebbe Rashab was satisfied with this answer, and stopped crying. And yet, the Rebbe Rashab did cry, and according to Nachmanides,there is nothing that happened to Abraham that would later not occur with his children, Abraham’s Divine revelation in some way can and will happen to his children. Abraham paved the way for us to have a similar experience: To see the inner forces that shape our outer realities. But in order to see your life in this special way, you too have to commit to the same two things that Abraham committed to: One, you must travel away from your own subjective trappings and remove the immediate pressures that block you from seeing what lies within. This includes controlling the flow of images, sounds, tastes, touches and smells, which enter your being and clutter your life. Two, you need to focus on the inner forces and the purpose of it all, ensuring that the means that lead you there are not confused with the end goal. Too often we get so consumed with the tools – earning a living, shopping, preparing – that we are left with no time, energy and space for the purpose of all these tools. Sometimes we may even forget that there is a purpose, like embarking on a journey and then forgetting the destination. This commitment to the higher goal, as opposed to the means, in turn manifests in a life driven by virtue and selflessness, rather than instant gratification and immediate needs. Once you demonstrate your commitment to this approach, new doors will open up from within. And then – and only then – will you begin to see the extraordinary in the ordinary. Every detail of your life begins to burst with enormous energy. You learn to savor every sight, every sound, every taste, every touch, every smell. You can look at a wild flower and see a flower, or you can see, as Blake put it, Heaven. You can listen to a bird sing and hear a song, or hear the music of angels. You can gently caress the finger of your beloved and touch a finger, or you can touch eternity. A new perspective emerges in your life, teaching you how to bridge the visible and the invisible, the sensory and the supra-sensory – how to use your senses to reach beyond your senses and experience new dimensions. And above all, your new vision allows you to release fresh energy from every experience you encounter: In a life driven by self-interest every situation is numbed and deadened by “what’s in it for me?” In stark contrast, a life driven by seeing the Divine opens your eyes, ears, taste, touch and smell to experience yourself and others in unprecedented ways. You learn to see new things, and see old things in new ways. Every situation then becomes an opportunity to generate innovative power to help others and improve the world – directing every detail of your life toward the sublime, revealing the Divine purpose in everything, fulfilling the very objective of existence. Now let us apply this principle to the events of our times. Segun tomado de, http://www.algemeiner.com/2014/11/07/a-new-world-order-the-extraordinary-within-the-ordinary/ el lunes, 10 de nov. de 2014.